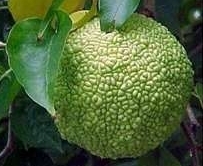 Also known as Hedge-apple. Very fast, vigorous growth 20 to 40 feet, occasionally over 60 feet. Distinguished for its yellow green, orange-shaped inedible fruit, which appears in fall, often used for dried decorative arrangements. Fall foliage, yellow. Often used for windbreaks or fence rows, due to its fast, dense growth and heavy thorns, which make an impenetrable barrier against people and livestock. Space 4 feet apart. Withstands cold winds and droughts well. Native to southeastern Oklahoma and northeastern Texas. Now naturalized over much of central and eastern United States.